What are common causes of sciatica? What are risk factors for sciatica? What are sciatica symptoms? How do health care professionals diagnose sciatica? Which health care specialties treat sciatica? What are sciatica treatment options? Are there home remedies and self-care exercises for sciatica? What is the outlook (prognosis) for patients with sciatica? Is it possible to prevent sciatica? 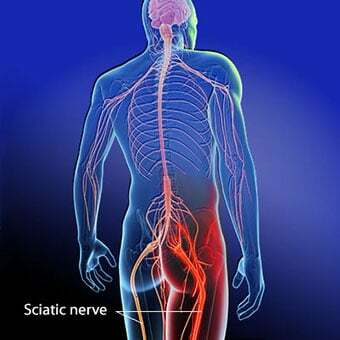 Sciatica is nerve pain from irritation of the sciatic nerve. The sciatic nerve is the largest nerve in the body. The sciatic nerve begins from nerve roots in the spinal cord in the low back and extends through the buttock area to send nerve endings down the lower limb. Sciatica symptoms include pain that people typically feel from the low back to behind the thigh and radiating down below the knee. Treatments for sciatica depend on the underlying cause and the severity of the pain. Sciatica is pain in the lower extremity resulting from irritation of the sciatic nerve. The pain of sciatica is typically felt from the low back (lumbar area) to behind the thigh and can radiate down below the knee. The sciatic nerve is the largest nerve in the body and begins from nerve roots in the lumbar spinal cord in the low back and extends through the buttock area to send nerve endings down the lower limb. Radiculopathy is sometimes referred to as sciatic nerve pain. While sciatica is most commonly a result of a lumbar disc herniation directly pressing on the nerve, any cause of irritation or inflammation of the sciatic nerve can produce the symptoms of sciatica. This irritation of nerves as a result of an abnormal intervertebral disc is referred to as radiculopathy. 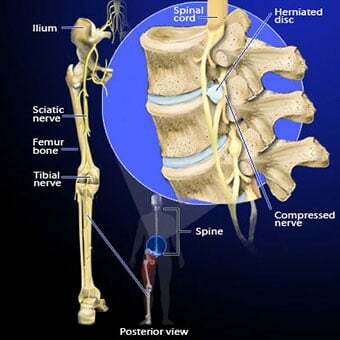 Aside from a pinched nerve from a disc, other causes of sciatica include irritation of the nerve from adjacent bone, tumors, muscle, internal bleeding, infections in or around the lumbar spine, spondylolisthesis, injury, spinal stenosis, cauda equina syndrome, osteophyte, and other causes. Sometimes sciatica can occur because of irritation of the sciatic nerve during pregnancy. Risk factors for sciatica include degenerative arthritis of the lumbar spine, lumbar disc disease, and herniated disc, and trauma or injury to the lumbar spine. Sciatica causes pain, a burning sensation, numbness, or tingling radiating from the lower back and upper buttock down the back of the thigh to the back of the leg. The result is lumbar pain, buttock pain, hip pain, and leg pain. Sometimes the sciatic pain radiates around the hip or buttock to feel like hip pain. While sciatica is often associated with lower back pain (lumbago), it can be present without low back pain. Severe sciatica can make walking difficult if not impossible. Sometimes the symptoms of sciatica are aggravated by walking or bending at the waist and relieved by lying down. The numbness and pain relief by changing positions can be partial or complete. Sciatica is diagnosed with a physical exam and medical history. The typical symptoms and certain examination maneuvers help the health care professional to diagnose sciatica. Sometimes, X-rays and other tests, such as CT scan, MRI scan, and electromyogram, are used to further define the exact causes of sciatica. Physician specialties that evaluate and treat sciatica range from generalists to subspecialists. These specialties include general medicine, family medicine, internal medicine, gynecology, orthopaedics, neurosurgery, rheumatology, pain management, and physiatry. Other health care providers for low back pain include physical therapists, chiropractors, massage therapists, psychologists, and acupuncturists. Bed rest has been traditionally advocated for the treatment of acute sciatica. But how useful is it? To study the effectiveness of bed rest in patients with sciatica of sufficient severity to justify treatment with bed rest for two weeks, a research team in the Netherlands led by Dr. Patrick Vroomen randomly assigned 183 such patients to bed rest or, alternatively, to watchful waiting for this period. To gauge the outcome, both primary and secondary measures were examined. The primary outcome measures were the global assessments of improvement after two and 12 weeks by the doctor and the patient. The secondary outcome measures were changes in functional status and in pain scores, absenteeism from work, and the need for surgical intervention. Neither the doctors who assessed the outcomes nor those involved in data entry and analysis were aware of the patients' treatment assignments. The results, reported in the New England Journal of Medicine, showed that after two weeks, 64 of the 92 (70%) patients in the bed-rest group reported improvement, as compared with 59 of the 91 (65%) of the patients in the control (watchful-waiting) group. After 12 weeks, 87% of the patients in both groups reported improvement. The results of assessments of the intensity of pain, the aggravation of symptoms, and functional status revealed no significant differences between the two groups. The extent of absenteeism from work and rates of surgical intervention were similar in the two groups. The researchers concluded that "among patients with symptoms and signs of a lumbosacral radicular syndrome, bed rest is not a more effective therapy than watchful waiting." Sometimes, conventional wisdom is not as wise as research! Other treatment options for sciatica depend on its cause and include addressing the underlying cause and physical therapy. Transcutaneous nerve stimulators (TENS units) are sometimes useful for more chronic forms of sciatica. A variety of low back conditioning and stretching exercises are employed to help people recover from sciatica. Medications used in the treatment of sciatica include pain relievers, muscle relaxants, anti-inflammatories, and antidepressants. Antidepressants actually can help in this setting by reducing pain perception in the brain. Other medications that may be helpful include gabapentin (Neurontin) and duloxetine (Cymbalta). Cortisone medications, given orally or by local injection (epidural injection), can sometimes be helpful in relieving sciatica pain. Surgical procedures can sometimes be required for persisting sciatica that is caused by nerve compression at the lower spine. Sometimes pain management specialists help with chronic sciatica conditions. The duration of sciatica is critically dependent on its cause. A herniated disc, back sprain, shingles, and degenerative lumbar spine can all cause temporary forms of sciatica, lasting from days to weeks. Each can also cause chronic sciatica. Sometimes degeneration of the lumbar spine and discs can cause chronic sciatica that persists unless a surgical intervention is performed. Keys to the management of acute sciatica include relief of pain and relaxing associated muscle spasms. Home remedies include heat and cold pack topical administration, over-the-counter pain medications such as acetaminophen (Tylenol), non-steroidal anti-inflammatory drugs like naproxen (Aleve), ibuprofen (Advil, Motrin), and aspirin, and physical therapy that incorporates gradual exercises and stretching. Exercises and stretching can sometimes best be guided by physical therapists. Depending on the precise cause of the sciatica and the duration of symptoms, the outlook for recovery from sciatica ranges from excellent to having long-term chronic symptoms. Sciatica can be prevented to some extent by avoiding low back trauma injuries. Conditioning exercises, such as yoga and Pilates, can sometimes help to prevent injury to the low back. Cass, Shane P. "Piriformis Syndrome: A Cause of Nondiscogenic Sciatica." Current Sports Medicine Reports 14:1 January 2015: 41-44. Vroomen, P.C., et al. "Conservative treatment of sciatica: a systematic review." J Spinal Disord 13(6) Dec. 2000: 463-469.